Want to know how to absolutely make an optimist’s day? 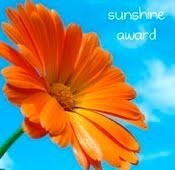 Tell them that they’ve been nominated for the Sunshine Award! How cool is that? I was nominated by Alli, a beautiful girl with an incredible blog that EVERYONE should check out: http://exhilaratedliving.wordpress.com/. She’s a recovering pessimist, who discovered the joy of positive-thinking and optimism through a Psychology course in college. Yay for converts to the bright side! The nomination requires me to answer the questions below and post the logo (see above) and then nominate a few blogs that I love and appreciate. My inability to say no. I’m a very, very bubbly person naturally and I like to make the people around me happy. With that in mind, I find it very challenging to say no [when asked for favors, special tasks, etc.] because I fear upsetting or disappointing them. As a result, I often find myself overextended, exhausted, and sleep-deprived. Hmmm, don’t really have a theme song, but I love upbeat music. I’m currently obsessed with Passenger’s song, “Let Her Go” as well as every song from The Lion King soundtrack. Books. My puppies. My husband. School. Writing. My job. LIFE! What generation do you wish you had been more apart of? Currently, I find slinkies to be the bomb-diggity. When I was a little girl, you couldn’t break me away from my radio flyer wagon, the Barbie dream house my mother built by hand, and my Cabbage Patch dolls. Baking! I absolutely love to bake cupcakes, brownies, and cakes. I have an account that I log into about three times per year. I haven’t reached that level of narcissism yet where I can really find enjoyment in actively using it. TONS! More than I can detail in one blog post. The primary goal, however, is to be published five times while I’m 28. I’ve been published twice so far, and I’m only two months into 28, so I’m on a good path! In terms of calendar days – probably October 30th. That’s my husband’s birthday! In terms of “any” day, it would have to be the perfectly clear, azure-blue days of sunshine we get here in Florida during the Autumn and Spring. No humidity, a light breeze, a perfect 74-78 degrees. Ahhhhh, heaven. Banana Blurbs: http://bananablurbs.com/ – A blog run by a classmate and friend, Christina, that talks about a little bit of everything! A Woman’s Guide: http://patticlark.wordpress.com/ – A really interesting blog regarding Creative and Self-Empowerment for Women! Very motivational! Exhilarated Living: http://exhilaratedliving.wordpress.com/ – I mentioned her above, but definitely worth a second review: AWESOME! So… there we go! I get an award, you get some random trivia about me. It’s a win-win!